The Utah Department of Work Force Services releases data on current jobs and unemployment for the state on a monthly basis. Below is the latest video detailing the most recent employment data for the month of February 2019. The state of Utah dropped to a 3.0% unemployment rate ranking below the national average which dropped slightly to 3.8%. 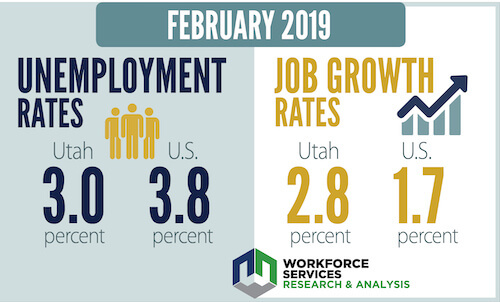 Utah also reported 2.81% job growth (compared to February of 2018) rate against the 1.7% national growth rate. We're seeing moderate and healthy job growth, and Your Employment Solutions is uniquely positioned to help employers find the right people for the jobs they need filled in this competitive employment economy.